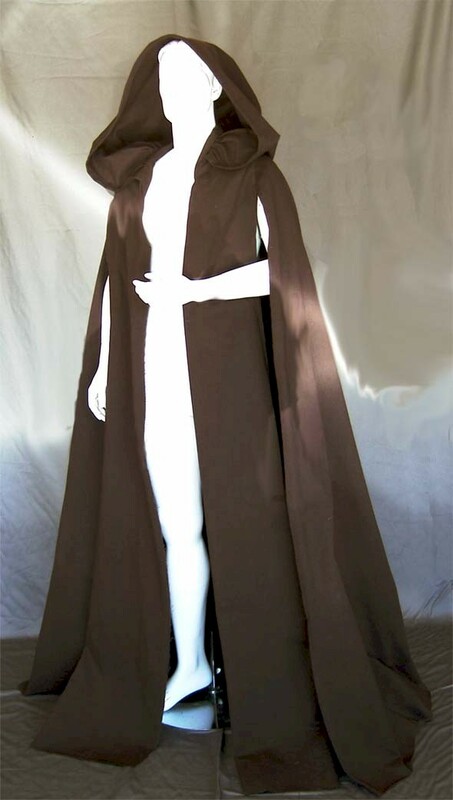 The Apprentice Cloak is inspired by the cloak worn by Anakin Skywalker in Attack of the Clones. This is the most accurate recreation anywhere on the 'net. The Mad Seamstress designed this original pattern from notes and pictures taken during a museum exhibit visit in her town. Now The Mystik Seamstress has updated the pattern using production stills and high def screenshots. Same great look, slightly different construction. 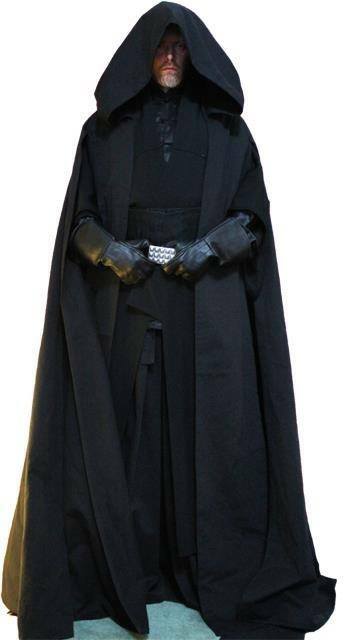 The Apprentice Cloak has two full back and side panels, an extra large sized hood (even longer than the Master's Robe! ), and two lined and pressed tabards for the front. This isn't just a regular cape with slits cut up the sides. This is a fully realized, tailored piece that uses more fabric and construction time than our Master's Robes. Because the original was designed for someone with a tall, lean frame it may not hang quite as well on the more stalwart warriors. It is constructed from the same bottom weight poly/cotton twill as Master's Robes making it a robust garment with great drape, endurance, washability, AND it's wrinkle resistant. The majority of the seams are turned under and sewn flat for extra durability and a great finished look. Sturdy like a solid pair of jeans that will last you for many years. Standard color choices are Brown or Black. If you are interested in another color, feel free to contact us. Costume suggestions: Anakin Skywalker from Attack of the Clones, and many others. Heard about our guarantee? It's not just for workmanship, anyone can do that. We want you happy with your robe. Love it or get a no-questions refund. Period. The robe has to be unworn, that's all. Check details on our GUARANTEE page. We don't leave fellow fans swinging in the wind! Questions? No problem. Cruise over to the FAQ page and if that doesn't cover it, we're happy to hear from you. We love chatting with other fans! For domestic orders (this includes all 50 US states, APO/FPO, and all US territories), you can order from our Online Store. Be sure to include all of your relevant measurements and a deadline date in the order notes. "ASAP" is not a date; your order will only go to the back of the production line. Just let us know when you need it, we'll get it there! You will receive a confirmation email within one business day of placing your order. Once you've made sure that all of the information we have is correct we will get started on your robe/cloak and ship it to you within 14 business days (though typically much sooner) barring weather problems and Murphy's Law. If you would prefer for us to confirm by phone or text, please add that to your order notes. International orders require a few extra steps on our end, so send us an email and we can get your order set up straightaway. International orders have additional costs to cover shipping which varies depending on what region of the world we're shipping to. 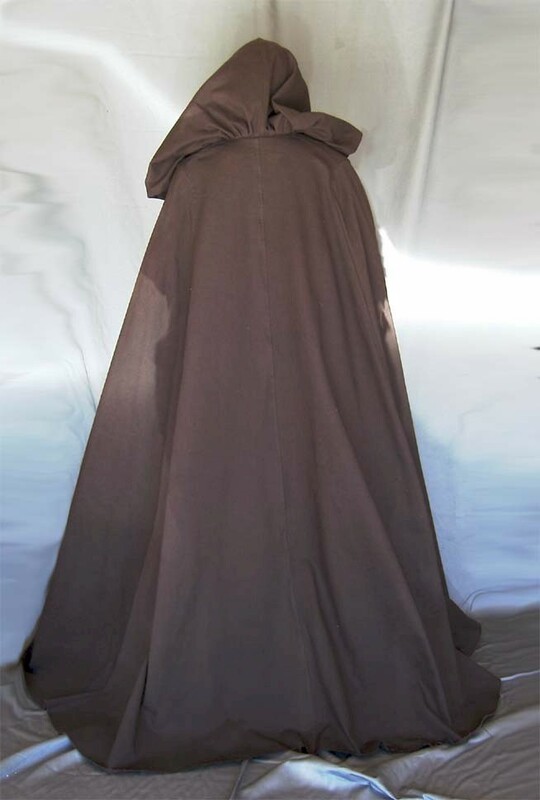 Wide front tabards, extra long hood, and full back and side panels for that extra WOW! factor. Full back panels for the epic swish. 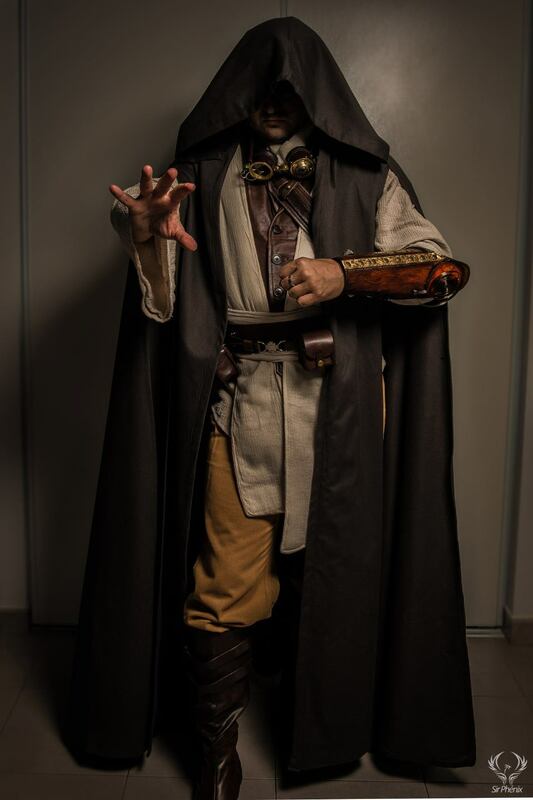 Another customer getting creative with the look in a Steampunk Jedi variant.